Getting total coverage for your lawn, orchard, field, or pasture can be time-consuming and costly. 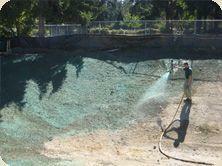 But hydroseeding is both easy to apply, affordable, long-lasting, and an affordable alternative to sod. From deciding on the perfect ratios of grass seed and fertilizer to delivering and applying the mixtures, our technicians take care of everything for you. Hydroseeding is the preferred method for covering outdoor expanses with healthy, high-functioning grass. But is it right for you? And…what is hydroseeding, exactly? Hydroseeding is a method of grass overseeding – applying seed mixtures to soil that already contains grassroots in order to eliminate thin areas. The seed mixture is actually a slurry of grass seed, paper or wood fibers, water, fertilizer, and a sticky agent called a tackifier that helps the mixture stay in place until germination. This is particularly helpful on slopes or in places like Chehalis where it’s both hilly and rainy. The seed mixture is sprayed onto the lawn by a commercial hydroseeder – a machine designed to cover large areas in a small amount of time. Regardless of slope or weather conditions, a hydroseeded lawn will yield 100 percent seed growth, which makes it an ideal choice for residents who own ranches, farms, pastures, and property with high acreage. 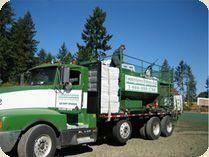 Hydroseeding is ideal for horse pastures, shady areas, mixed or sunny areas, sports fields, and public parks. It’s also a great option for lawns that have trouble with patchy areas because of tree cover or malnourished soil. The best time of year to hydroseed your lawn is spring, depending on the weather conditions, and fall. Depending on the starting condition of the area, the hydroseeding process can involve preparing the soil or loam by aerating and dethatching, and leveling and clearing established grasses and weeds. Next, the slurry is sprayed using a back and forth motion over the area so it is evenly distributed. Our technicians are careful to only spray in designated areas, avoiding planting beds, walkways, or other areas where grass is unwanted. Then, we water the area depending on water conditions and level of sunlight. The area may need to be watered and fertilized again until it’s established, so we’ll help you determine a cycle that works for your particular landscape and weather conditions. Learn more about the advantages of sod, seed, and hydroseed with our self-scoring method worksheet.